In my line of Transformers Toys collection, the animated series of Transformers toy is the most simplicity and symmetrical in design. Beside having simple line (without complicated feature/detail) , their appearances are normally very cartoonish which is unlike any of my Transformers toys, except the TF Disney Label. This is what i like about them. Simple, nice and smooth. 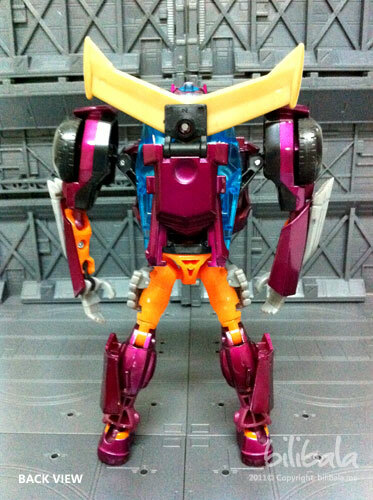 What I am going to share today is one of my TF Animated toy collection named Rodimus. 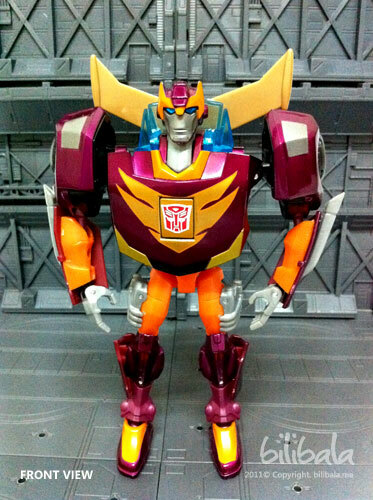 If you are a fan of Transformers, you will get to know of this character called Rodimus (Previously known as Hot Rod) which in turn will become the successor of Optimus Prime. 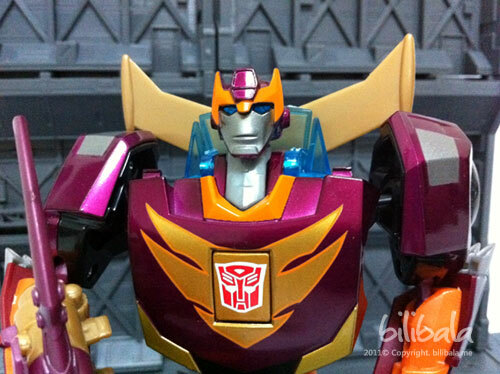 This Rodimus is actually of the new line of TF animated toys from Takara Tomy. In which the different between old and new is that their way of coloring/painting is different. 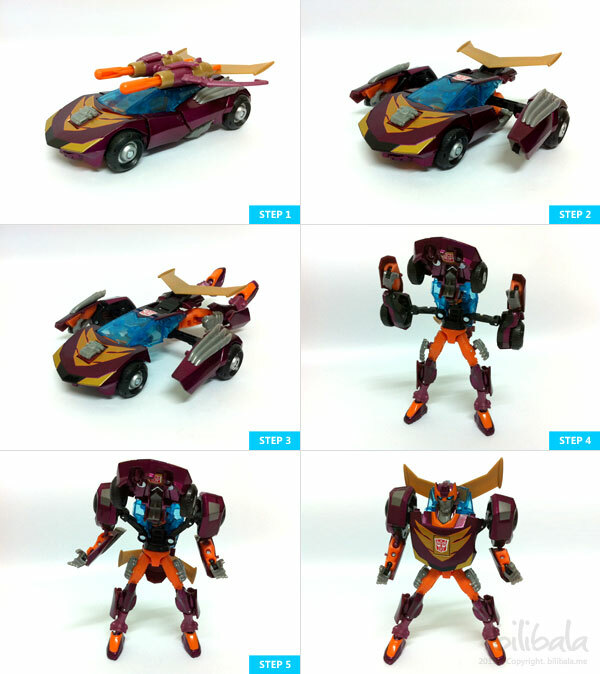 You can notice that the new TF animated toys have more glossy and sometime striking color as compared to the old ones. In other words, the new TF Animated toys will look much more cooler and “realistic” as the feeling of plastic is being diminished. The build quality is of Takara Tomy standard: Strong, sturdy and very solid joints as compared to Hasbro. There is no doubt about the QC system being implemented by them. 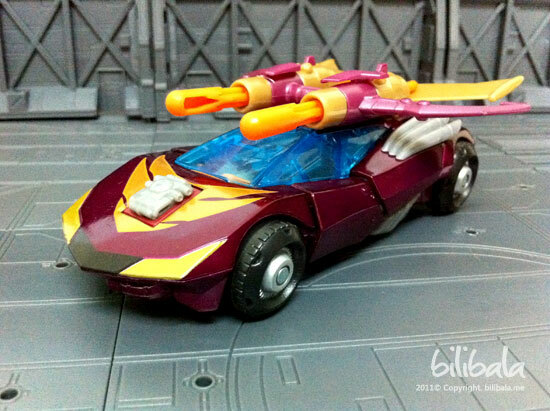 The Rodimus takes the form of a Cybertronian Race Car which has a resemblance of the G1 Rodimus sport car. As you can notice, the weapon (the Double Bow Canon) is being affixed to the top of the car. The details for the car is simple but nice. 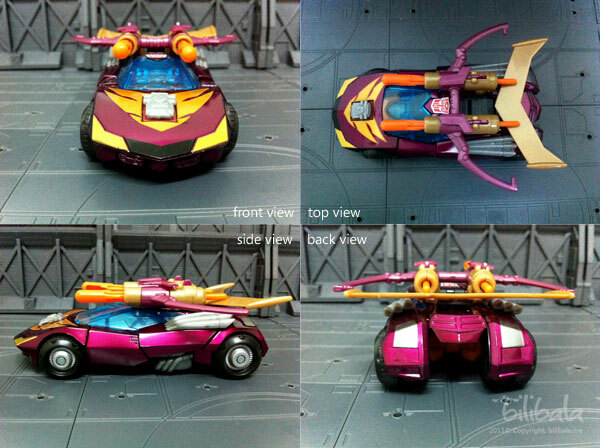 You really wont see complicated lines design in the vehicle mode and everything seem very symmetrical. That’s what TF Animated Toys are about. But the fact is, less is more. It does looks cool with this sport car in your collection 🙂 Oh ya, one point worth mentioning is, they are using a semi translucent blue for the car windscreen. And for the tire, it is a hard plastic like what other standard Transformers toys have. The transformation process isn’t really difficult. I would put it as intermediate as most of the process is quite straightforward. A picture sums it all. 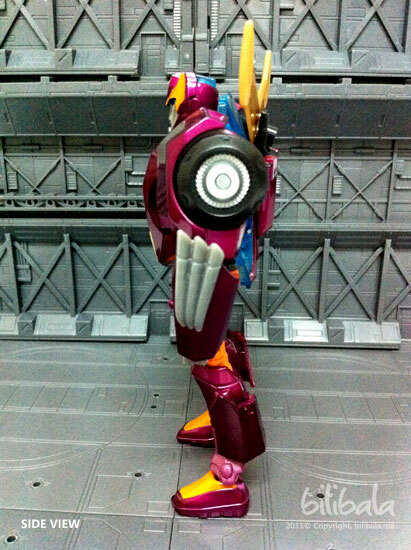 However, there are actually not much “special” gimmicks for this robot. Some of it quite standard (light piping and weapon wise) and only 1 of it which i think is quite okay as one of its gimmicks which is the hidden Autobot Insignia. It is quite creative to hide the insignia underneath the intercooler engine of the car. 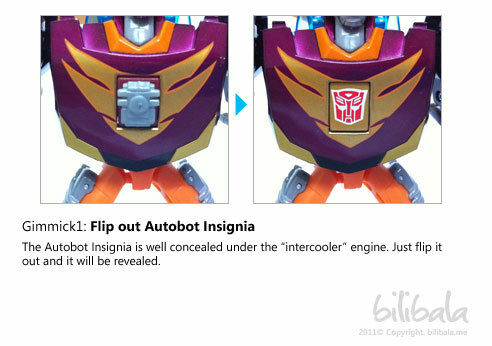 You have to flip the engine manually only it will reveal the insignia. IF there is an automatic mechanism being built to it, it will be even nicer. My personal rating to this robot is 9/10. 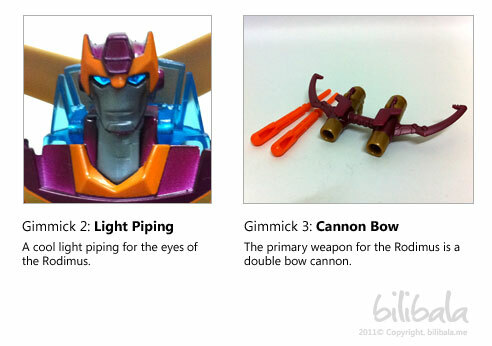 U captured the iris of rodimus, swindle has the same feature too. Only that it's triangle shaped.